→What is The Best Eyelash Extension Glue that Lasts? Any woman's beauty regimen these days can easily balloon anywhere from 10 to 30 steps. That's why we're all in a desperate scramble to find hacks that will compress our regular prep time without having to compromise our final look. Glam smarties know there are ways, getting an eyelash extension is one of them. Gooey, smudgy eyelashes that feel like a wire was hanging over your lashes - it's the typical experience you get wearing your long-wear mascara for as little as two hours straight. Curling, pulling, coloring are not enough assurance that your eyelashes won't misbehave but getting eyelash extensions are more than likely to bring you beautiful, fluttery eyelashes that don't take a chunk off of your day to get nor to manage. The keys to giving yourself eyelash extensions that last call for two non-negotiable requirements. Will the product cause you irritations? Eyelash extension glue may contain highly irritating ingredients. Take note of your history of allergic reactions and always check the label for a possible allergy to any ingredient in the formulation. To be sure, always perform a patch test whenever you intend to do-it-yourself or ask your provider about product safety information before you proceed. Does the formula contain toxic ingredients? These can redound to more serious side effects than just itching, redness and swelling. Ingredients such as formaldehyde, commonly used as a preservative, can cause you detrimental health effects over the long run. Do you have sensitive skin or eyes? There are eyelash extension glues that are formulated specially for sensitive eyes and skin. 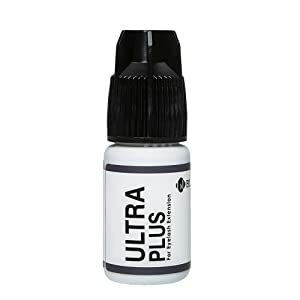 These often contain lower concentrations of adhesives which typically make eyelash extension last between 1 and 3 weeks only. Will you use install your eyelashes yourself or will a pro do? The concentration of active ingredients significantly changes from personal use to pro. Most of the time, irritations are caused by misuse of products intended for professional or salon use only. Failing to follow directions can easily cause side effects, which includes extreme eye irritation and skin problems. Where are you having your lashes installed? Room humidity can play a part in the curing process of how your eyelash glue dries up. In turn, that will dictate how long it will take for your lashes to naturally fall off. What is your eyelash extension made of? Your choices include mink, silk, synthetic or poly-fiber. Some glues only bond with specific eyelash extension materials. Do you have other scheduled appointments? Timing is of the essence when getting your eyelash extensions installed. Usually, an eyelash extension glue needs between 24 and 48 hours to dry out totally and that means you can’t shower until the end of that. The succeeding five sections present the pros and cons of five of your best options when selecting a suitable eyelash extension glue. Formulated for professional use only. 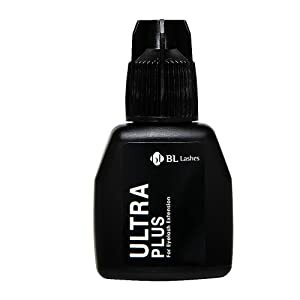 This eyelash extension glue is made with quick drying and strong binding ingredients that get your eyelashes installed and ready to show off in just 2-3 seconds. This product in made by Blink, a manufacturer based in South Korea. 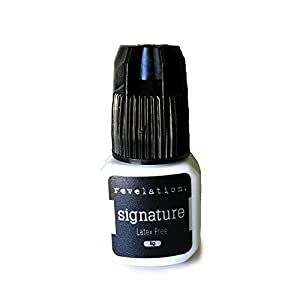 Made with black tinted adhesive makes this practically invisible as it sticks your extensions with the strands of your real eyelashes. Shelf life of up to 6 months when container is unopened. Also from Blink, this eyelash extension glue can get your fluttery eyelashes set up as soon as the glue and your lashes meet - no waiting time required. Black tint finish practically makes the adjoining points indistinguishable, as if you’ve always had long, curly, to-die-for eyelashes. This strong bond glue, made for pro and not for DIY use, can last your eyelash extensions up to 5 weeks. This eyelash extension glue is far from being the best formula for more sensitive eyes and skin types. 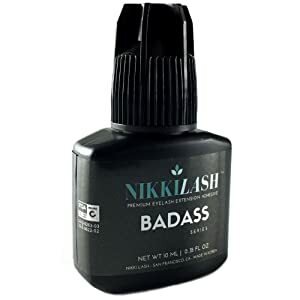 This product, just like almost any other glue is made with highly irritating and toxic ingredients, except this one has found a way to get your eyelash installation done minus the film forming latex. Latex is an extremely allergy and irritation causing ingredient. This is an eyelash extension glue made by a Korean manufacturer for professional use only. As such, expect higher concentrations of possibly highly toxic and highly irritating ingredients that can cause itchiness, redness and swelling when failed to use as directed. This product is meant for use only on natural eyelash and not on skin. This is the eyelash extension glue that has been specially formulated for your sensitive skin and eyes. US-based manufacturer claims it is a "no tears" formulation. It does not contain formaldehyde and won’t emit harsh, toxic, irritating fumes. 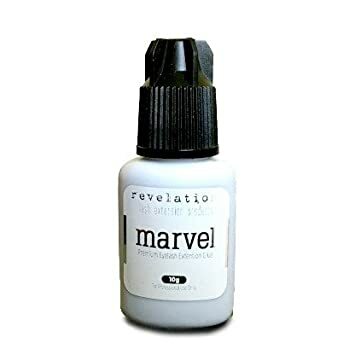 Of the 5 eyelash extension adhesives presented above, the best product, after getting the real score on the pros and cons, will have to be the Marvel Eyelash Extension Glue for DIY user. The safety pros of this product clearly outweigh the aesthetic downsides. With a less irritating formulation that you can easily install by yourself, more frequent reapplication shouldn’t become a problem. It can be argued that eyelash extensions are one of the finest beauty innovations introduced in the past few years. Unfortunately, like many other cosmetics, enjoying its benefits often come with a hefty price - your health and safety. The bottom line is that, you always have the right to make the right choice. Whenever the choices boil down to product safety on the one hand and superficial benefits on the other, you always err on the side of caution.